Jeremiah Dunnings (183-PG, college: William Carey) opened the game up with a 3 point field goal from the left wing and Eurobasket would never look back in a 82-65 victory. It was a balanced scoring attack across the board as Dayton Mickens (203-F-91, college: Ark.-Monticello) led the team in scoring with 11, while Derrick Tony Seldon (196-F/C-93, college: W.Connecticut), William Wise (206-F), and Ethan Murray (188-G-93, college: Coll.of the Ozarks) all finished with 10 points each. 'It was the first time our guys went through an extravagant announcement scene on this trip, I feel we answered that bell well with our quick start. I feel we got complacent in the second half and got away from what makes us really good,' ESL Select Head Coach Allen Mkrtychyan said. Eurobasket led by as many as 17 points in the first half with Itzehoe struggling a 0-9 from 3 point range. It didn't get any better in the second half as they finished a combine 1-24 from the 3 point line. Americans Darren Galloway (a former ESL participant) and Kaimyn Pruitt could never find their rhythm. Stephan Shepherd was the only player for Itzehoe to reach double figures. 'This might have been one of our best defensive performances of the tour,' ESL Tour Manager Dustin Simcox said. 'They missed some easy ones but I feel overall we put a lot of pressure on them throughout game to speed them up. That team is better than 34% from the field. But it shows how far we have come since Day 1'. Wise had his most productive day across the board with 10 points, 7 rebounds, 2 assists, 2 steals, and 2 blocks. Point guards Maurice Cole (182-PG-90, college: Dixie St.) and Jack Montague (183-PG, college: Yale) both came off the bench to spark ESL in the 1st half. Cole came in and quickly banked a three pointer from the right wing and dished out 3 assists in only seven 1st half minutes. Montague scored a quick seven points off a three, a nice one dribble pull up to the corner, and a pair of free throws in that final minutes of that first half. Cole would finish with 8 points and 4 assists receiving praise from Itzehoe Coach Patrick Elzie and Montague would end with 9 points and 4 assists. Two players who will not get a lot of publicity in the box score but played vital roles in the game was Josh Biber (196-G/F-91, college: Brown) and Ajani Santos (201-F/C-94). 'Ajani and Josh are our dirty work guys. They do not get a lot of looks on the offensive end but they continue churn and get things done on the defensive end and the glass. With a team full of offensive weapons these two have sacrificed a lot of offensive looks for the team. Biebs was a +14 and Ajani was a +13 overall tonight. The two highest on the team' Simcox said. 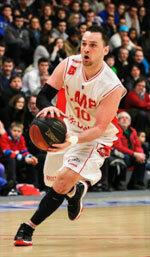 Tonight Eurobasket moves on to Berlin to play Thomas Roijakkers and his Stahnsdorf team looking to go 9-0 on the trip.